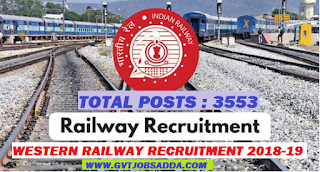 RRC Western Railway Recruitment 2018-19 Western Railway invites ONLINE applications from interested Applicants for engagement as Act Apprentices against the 3553 slots notified for training in the designated Trades under Apprentice Act 1961 at various Divisions, Workshops within the jurisdiction of Western Railways for the year 2018-19. 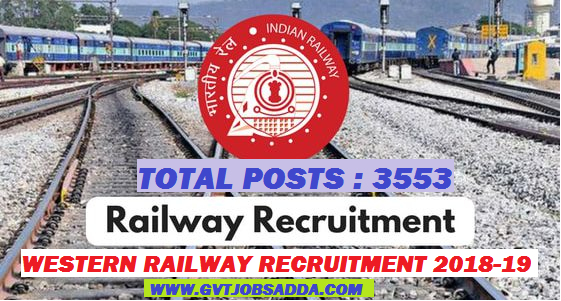 Those Candidates who are interested & eligible for Western Railway Recruitment 2018-19 Candidates may check Recruitment notifications for Western Railway Recruitment 2018-19 & apply before last date of online apply. Brief information has given below about Western Railway Recruitment. SC/ST/OBC- Upper age limit is relaxable by 05 years in case of SC/ST applicants and 03 years in case of OBC Applicants. Persons with Disability (PWD) :- Upper age limit is relaxed by 10 years. Application fees (Non-refundable) – Rs. 100/-. Matriculate or 10th Class in 10+2 examination system with minimum 50% marks in aggregate from recognized Board. ITI certificate affiliated to NCVT/SCVT is compulsory in relevant trade. For More Details About Western Railway Recruitment 2018-19 Candidates should visit official website & Read notification carefully and apply online before last date.